Open: Daily from 7:30 a.m. – 7:30 p.m. 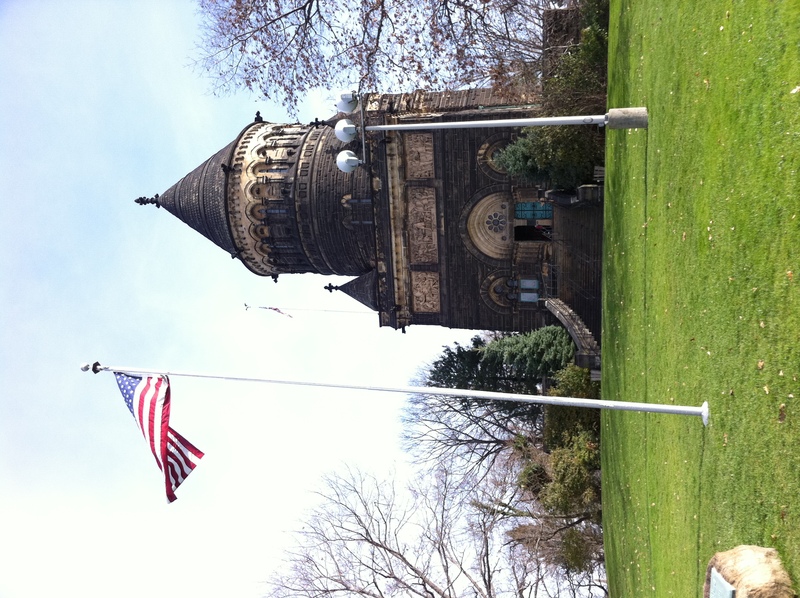 The Garfield Monument and Wade Chapel are open daily between April 1 and mid-November from 9 a.m. until 4. Cleveland, Ohio’s Lake View Cemetery is a large, lovely rural garden cemetery that climbs a ridge east of town and provides spectacular views of Lake Erie and the metropolis stretching westward below. The cemetery also performs as an arboretum, in which many of the trees labeled. 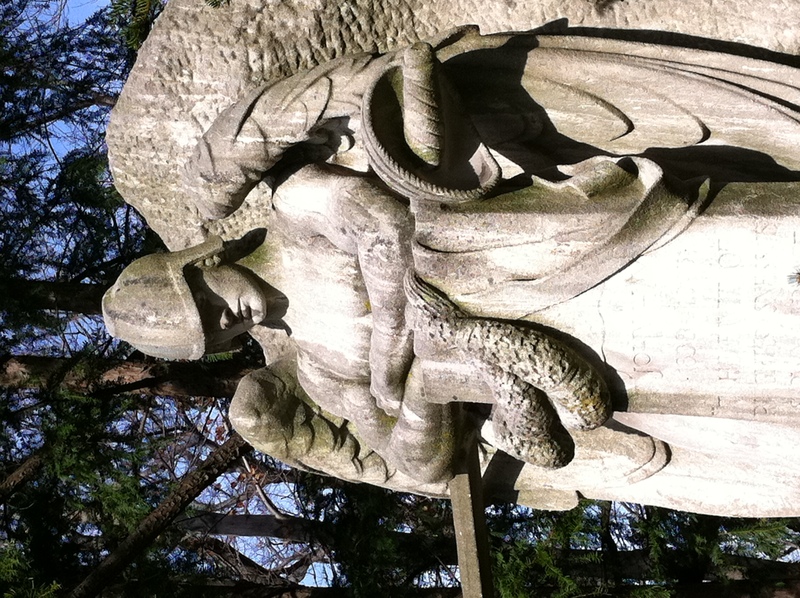 Beneath the stately old trees, much of the cemetery is full of heavy granite markers, but among them stand some marvelous works of art, including the warrior archangel Michael, guarding the grave of John M. Hay, Secretary of State under President William McKinley. Two grieving women, reminiscent of the Duke of Burgundy’s Mourners, attend the sarcophagus of the E. M. Peck family. More modern figures climb the heavy granite monument to the Evans family, re-purposed from the family’s swimming pool. Just inside the Euclid Gate stands the poignant monument to the 175 victims of the Collinwood School fire, in which an angel protects children with her arms. The unexplained fire struck the relatively new building in March 1908. Teachers managed to save half their charges, but some children panicked and fell, blocking the stairwell so that others couldn’t escape. The tragedy brought national attention to the issue of school safety for the first time. Another of Lake View’s treasures is the Wade Chapel. The classical building is named for Jeptha H. Wade, who served as one of the cemetery’s first presidents. His namesake grandson hired Louis Comfort Tiffany and gave him carte blanche to design the chapel, which is unusual amongst cemetery buildings because it does not contain any permanent remains. Tiffany designed the breathtaking Resurrection window, which functions as the room’s focal point, in addition to the Biblical murals lining the walls. Because Tiffany refused to have soot besmirch his artwork, his friend Thomas Edison wired the chapel for electric lights, making it the first building with electricity in Cleveland. The showpiece of Lake View Cemetery is the monument to assassinated President James A. Garfield. Garfield was born in a log cabin in Cuyahoga County. Although his father died when he was 2, he was elected to the Ohio Senate, a post he left to serve as a Major General in the Civil War. He was elected to the U.S. House of Representatives, then the U.S. Senate, but received the Republican nomination for President before he took office. He served four months of his presidential term before a deranged fan shot him in the back. One of the bullets lodged in his spine. Garfield lingered for 80 days, before infection from his inept doctors’ unsterilized fingers finished him off. Nine years after his death, the President was laid to rest inside this monument, which has been called the first true mausoleum in America, since it serves both as his tomb and a tribute to his memory. The structure combines Romanesque, Gothic, and Byzantine architecture in a tower, domed interior, and crypt. A statue of Garfield captures him as if he’s just stepped out of his chair, a roll of parchment clutched in his hand. Around the room, stained glass windows embody the 13 original colonies as secular maidens. A maiden representing Ohio joins them as a gilded mosaic. Garfield’s coffin lies in the crypt, alongside his wife Lucretia. Their daughter Molly, who was 14 at the time of the assassination, and her husband Joseph Stanley-Brown, who served as Garfield’s private secretary, are inurned nearby. November 18th is Garfield’s birthday; this past Saturday celebrated his 180th birthday. Wreaths were laid, flags presented, and both boy scouts and girl scouts toured the monument. I was lucky enough to be in the right place at the right time and was able to enjoy the celebration and explore the tomb before it closed for the winter. 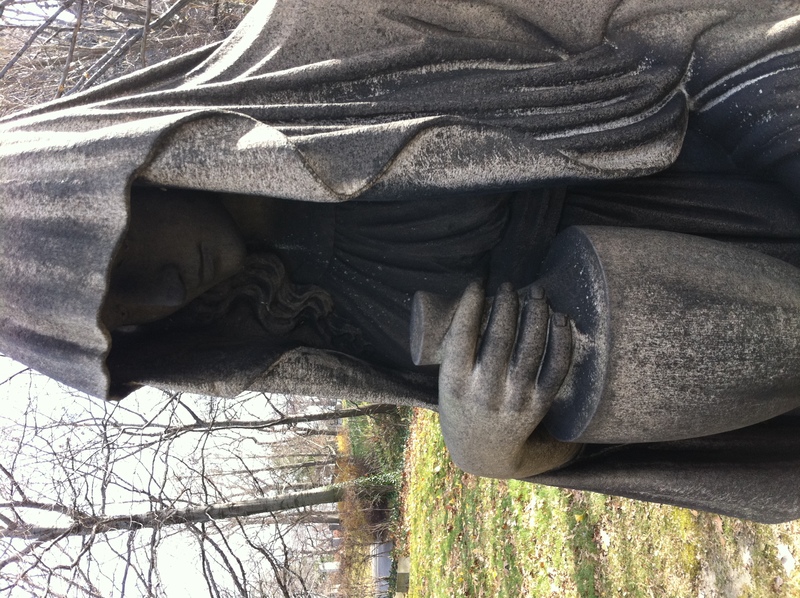 Lake View Cemetery presents a full schedule of events, including moonlight nature walks, architectural walking tours, and much, much more. The calendar is online here. Check back for 2012 events. Upcoming on December 3, 2011 is a tree-trimming at the grave of Rev. H. C. Schwann, who is credited with bringing the first candle-lit Christmas tree into a church in 1851. The tree-trimming will be followed in the afternoon by a program of holiday music and lights outside the Wade Chapel. This entry was posted in Cemetery of the Week, Famous person's grave and tagged James A. Garfield monument, Jeptha H. Wade Chapel, Lake View Cemetery, Ohio cemeteries, presidential grave. Bookmark the permalink.